Serving Size: 1 oz. or 2 tbs. Dynamic Health Laboratories’TM Certified Organic Noni Juice provides 12,000 mg of 100% Pure Organic Tahitian Noni ( Morinda Citrifola ) per 1 oz. serving. Commonly reported health benefits of Noni Juice include ~ Increased mental clarity and attention span ~ Boosts energy levels ~ Greater physical performance levels Noni Juice can also benefit the following integrated body systems: Immunity: supports the immune system’s natural ability to fight disease and infection. 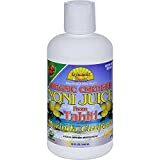 Circulation, tissues and cells: Dynamic Health Laboratories’TM Certified Organic Noni Juice is a superior antioxidant that helps rid the body of harmful free radicals. It also increases energy levels. Digestion: Dynamic Health Laboratories’TM Certified Organic Noni Juice supports proper digestion and helps you absorb more nutrients at the cellular level. Skin and Hair: Dynamic Health Laboratories’TM Certified Organic Noni Juice contains components that are specifically important to the skin and hair. It also helps carry beneficial substances to the skin. NONI(MORINDA CITRIFOLIA) is a remarkable life sustaining plant growing in the Tahitian Islands where the tropical climate and the rich volcanic soil provide the ideal growing conditions to produce the highest quality plants. NONI JUICE known for hundreds of years to have many natural healing properties, is produced from this plant. Noni contains naturally occurring minerals, enzymes, anti-oxidants, vitamins, phytonutrients and bioflavonoids. Noni is rich in proxeroxine and scopoleitin.Dynamic Health Laboratories’ Certified Organic Noni Juice provides 12,000 mg of Organic Noni ( Morinda Citrifola ) from Tahiti per 30ml serving and is made with a delicious raspberry flavor.Commonly reported health benefits of Noni Juice include~ Increased mental clarity and attention span~ Boosts energy levels~ Greater physical performance levelsNoni Juice can also benefit the following integrated body systems:Immunity: supports the immune system’s natural ability to fight disease and infection.Circulation, tissues and cells: Dynamic Health Laboratories’? Certified Organic Noni Juice is a superior antioxidant that helps rid the body of harmful free radicals. It also increases energy levels.Digestion: Dynamic Health Laboratories’? Certified Organic Noni Juice supports proper digestion and helps you absorb more nutrients at the cellular level.Skin and Hair: Dynamic Health Laboratories’? Certified Organic Noni Juice contains components that are specifically important to the skin and hair. It also helps carry beneficial substances to the skin.Dynamic Health Laboratories’? Certified Organic Noni Juice is rich in Proxeroxine, Scopoletin, Polysaccharides and contains naturally occurring Vitamins, Minerals, Enzymes, Antioxidants, Phytonutrients & Bioflavonoids. Dynamic Health Noni Juice contains 99.6% natural organic juice together with a miniscule 0.2% of natural raspberry flavour and 0.2% of Citric Acid. Noni… Tahiti’s Treasured Juice. The fruit of the Morinda Citrifolia (NONI) Plant has been treasured for thousands of years by native peoples inhabiting the exotic island of Tahiti. The warm, tropical climate & nutrient rich soil guarantees nearly perfect conditions for these plants to blossom. NONI has been used traditionally to help promote healthy living. NONI contains naturally occurring mineral, enzymes, anti-oxidants, vitamins, phytonutrients, & bioflavonoids. NONI is rich in proxeroxine & scopoletin. Organic Certified Noni (fruit) juice (99.6%_), Organic Certified Raspberry Flavor (0.2%), Citric Acid (0.2%).